Self storage units are a great way to free up some space in your home and office for the things that are most important to you. Millions of people around the world invest in self storage units to help them store everything from seasonal cars and recreational vehicles, to important personal documents, family heirlooms and seasonal clothing and decorations. Many people, however, don’t realize that certain items require climate controlled storage to ensure that they are fully protected. Below are four items that require a climate controlled storage unit. Appliances like refrigerators and ovens require climate controlled storage to ensure that their internal workings and moving parts don’t develop rust, which can damage mechanical parts and end up rendering them useless. If you have old appliances, or need to get certain appliances out of the way for a home renovation project, and you are thinking about putting them into self storage, ensure that they are going into a climate controlled unit. Leather and wood furniture are especially vulnerable to swings in temperature and humidity. If you put your wood or leather furniture into a storage unit that isn’t climate controlled for a long period of time, you might find out when it comes time to take it out that the structural integrity is not what it used to be, or that the wood and leather has rotted or cracked due to temperature fluctuations or condensation. If you are putting art or fabric into self storage, in addition to making sure they are properly wrapped and covered to protect them from pests and temperature swings, it is a good idea to also invest in a climate controlled unit. Natural fabrics, such as wool and cotton, and valuable pieces of art can deteriorate quickly in high humidity, as well as be completely destroyed by insect infestations. Any instruments, whether they be string, brass, woodwind or percussion, are easily damaged or even destroyed by wild temperature fluctuations. Humidity is especially damaging to musical instruments, which is why it often says expressly on the packaging, and in the instructions that come with an instrument, to ensure that it is stored in an environment where the humidity is not overly high. 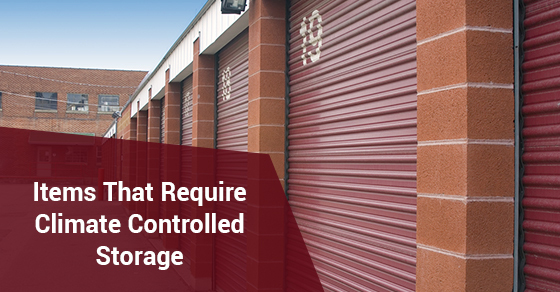 A self storage unit is a great way to make your life easier, but if you don’t consider the special climate requirements of the items that you are placing inside of it, you might end up doing more harm than good. Keep the above tips in mind when deciding if you should opt for a climate controlled storage unit and ensure that your items are well protected while in storage.